India beckons you to a new adventure, an adventure through varied landscapes, cultures and histories. Be a part of the scintillating diversity that is India and feel the joy of unravling mystries and discovering the simple pleasure of life. 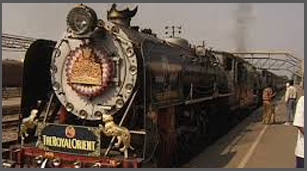 The most pleasent mode of travelling through India is by Train. The Indian Railways - the second largest railway system in the world, has over 62,300 km. of track laid between 7000 stations and over 11,000 locomotives. Today , it offers diverse tourist routes, magnificent hotels on wheels with five-star services and Indrail Passes, ideal for extensive trouble-free tours across the country. Can you hear the whistle ? Can you hear the chug-chug on the railway tracks ? Can you feel the rythem of the moving train ? Then hurry, don't miss your train ! 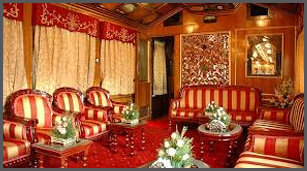 The Palace on Wheels, fully vestibuled, centrally air-conditioned has 14 coahces, named after former Rajput States. The train is completely self-sufficient, its public spaces include two restaurant coaches and a bar coach with an attached library. Each coach has four coupes, done in colours most reminiscent of the state, and highlighted by its royal emblem. Of the four compartments , two feature double beds, the other two twin beds. A third bed, for an additional person, or anaccompanying child, is in the form of a foldaway bed on a higher tier. Each compartment has an attached bath with running hot/cold water and showers, built in wardrobes overhead and night lights, piped music, reading lights etc. All coaches and corridors are fully carpeted. At the end of each coach is a separate lounge where passengers can relax when they wish to move out of their bed rooms. Departure : Every Wednesday from September to April. The Royal Orient, the train that transports you back in time. 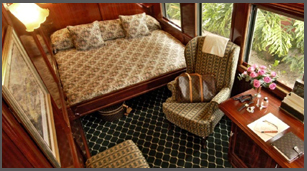 A fascinating blend of age-old luxury travel with 20th century amenities, with each original state coach reinforced and redecorated. The styles prevail, the luxuty remain. Only the service, the comforts, the advantages are modern. The original coach of Bhavnagar State built in 1929, a part of the entourage, has undergone many major modifications for the project. The saloon built for the Agent of the Governor General was originally painted completely in white and in the same pattern as the other coaches of the Viceregal train. The tour is 7 whole action-packed days on wheels. 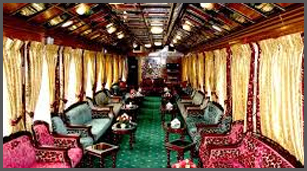 Every saloon has a small lounge, like the earlier train, and also has audio visual facility. Each cabin has its own wash-basin, mirror, socket facility for shaving, hair drying & battery charging. General facilities like mini bar, kitchenette, two toilets with hot and cold shower, piped music, TV with video exist in each coach. Separate dining cars offering Continental and Indian cuisine and snacks.